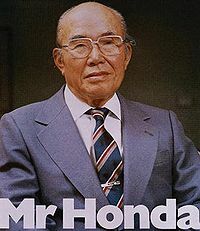 Soichiro Honda's meteoric rise from postwar bicycle-maker to world leader in motorcycle innovation and production is one of the most inspirational stories of our century: In the '50s, the company began building small motorcycles; by the end of the '60s, Honda® had unleashed the mighty CB750 Four, arguably the most important new motorcycle of the postwar era; the '70s saw Honda set all-time sales records with the CB350 and then hit the afterburner with the audacious CBX and liquid-cooled Gold Wing®. Recession and inflation in the 1980s found Honda, and most other motorcycle companies, grappling with growth and direction. The temporarily uncertain market required manufacturers to think carefully about their products and their customers, and about the evolving market segments. As has often proved the case, the decisions and leadership Honda exercised in the '80s made a profound impact on motorcycling, an impact that is still strongly felt today. It was within this decade that Honda helped define and establish each of motorcycling's principal segments: touring, sport bikes, cruisers, standards, dual-sport, and off-road. In the touring segment, prior to Honda's launch of the '80 GL™1100 Gold Wing Interstate™, major manufacturers left it to riders to build their own full-dressers; even Honda made no fairings or saddlebags. This all changed with the Interstate, Honda's first standard full-dress touring bike. It was the beginning of a touring legacy which, 19 years later, reveals the GL1500 Gold Wing as the most popular tourer ever built. The success Honda fostered in the full-dress touring market would soon be matched in other segments. In 1982 Honda introduced the first modern V-4 motorcycle engine in the Sabre™ standard model and Magna® cruiser, followed in '83 by the ground-breaking VF750F Interceptor®, the most important performance bike built by Honda since the original CB750 Four. The Interceptor's perimeter frame and narrow V-4 engine established design architecture still used on the current Interceptor. With riders such as Freddie Spencer, Wayne Rainey, Fred Merkel and Bubba Shobert at the controls, the Interceptor won five consecutive Superbike titles during the decade. In '86 the Interceptor was upgraded to the aluminum-frame, gear cam-drive VFR™750F and proved its mettle by winning eight of nine Superbike races. The mighty RC30™ racer soon followed, winning the first two World Superbike championships in 1988 and 1989. One of Honda's brightest stars of the '80s is certainly the CBR®600F Hurricane®. For most of the late '80s as well as the '90s the CBR set the sales and performance standards for the 600 class. That the inline-four-cylinder CBR could forge its own identity in a Honda product roster headlined by the V-4 VFR is a testimony to its spectacular engineering. Fully clad in aerodynamic bodywork, the CBR changed the notion that a motorcycle's engine must be seen. For Honda, the dollars normally spent on external engine cosmetics were instead put into performance development. Not only did the CBR establish a new manufacturing direction for sport bikes, the Hurricane also attracted legions of riders into the sport bike segment. Other models also showed Honda's willingness to think off the page, venturing into the rarefied air of discovery. These included the 1982 GL500I Silver Wing® Interstate, a mini Gold Wing; the recumbent Helix™ scooter; the CBX sport tourer; the ferocious '82 CX500 Turbo, Honda's first turbocharged production street bike; and the 1989 Pacific Coast®. The most successful of all was Honda's line of Shadow® cruisers. The technical accomplishments of the original '83 VT™750C V-twin Shadow cruiser are often overlooked in the bright glare of other Honda innovations of the time. Even so, the Shadow's liquid-cooled, narrow-angle V-twin engine offered a variety of innovative technologies, including three-valve combustion chambers and a vibration-canceling offset dual-pin crankshaft, a classic Honda feature still in use today. More importantly, the Shadow line helped strengthen the Japanese cruiser segment, currently the fastest-growing class in today's marketplace. Off-road, the CR®125 and CR250 motocrossers made Honda by far the dominant player in motocross. It all began with the world's first liquid-cooled motocrosser, the 1981 CR250. With its progressive-rate Pro-Link® suspension, this bike established the major engineering protocols for motocross machinery for the entire decade. Through the 1980s, Honda's Red Riders™ won 22 National motocross and Supercross titles, while helping Honda win eight manufacturers' titles. Cross-feeding technologies helped evolve the dual-sport XL and off-road XR™ machines. Four-stroke race bike and street bike technology improved the XL and XR singles, as did motocross frame and suspension technology. This cross pollination further indicated Honda's willingness to experiment, as motocross suspension technology was even applied to road racing. In 1986, this crossover helped Honda win every available National motocross title as well as the coveted AMA Superbike road racing title. Meanwhile, on the street, Honda models introduced technology such as integrated cylinders and crankcases for the V-4 engines and the GL1500 Gold Wing's Reverse System. Honda's worldwide racing successes during the '80s don't tell the whole story of competition. Equally as compelling as victory is the struggle, the company's willingness to risk failure in its search for innovative solutions. The now-famous NR™500 oval-piston Grand Prix machines of the early '80s absorbed enormous resources and never won a major race. But the NR500 project led to a new course, resulting in the innovative NS500 two-stroke triple, which brought Honda its first 500 GP title in 1983, and then the NSR500 V-4, which has won seven 500 GP titles to date. Characteristically, what Honda learned during its Quixotic quests often improved the breed, including the motorcycles we ride today. It is this innovative spirit, the willingness to experiment with new products and ideas, that has always helped define Honda's place in the motorcycle market. Sure, a few notions missed the mark. But more striking is the longevity of some of Honda's best ideas, models that were introduced or evolved in the '80s, and that are still with us today. The list forms the backbone of Honda's current model line: VFR and CBR sport bikes; Shadow cruisers, Nighthawk® standards; full-dress Gold Wings; and XR and CR off-road bikes. Honda's creative thinking sharpened the focus of each of motorcycling's principal classes, and led to machinery that motorcycle enthusiasts saddled up and rode straight into the '90s. This page was last edited on 21 January 2011, at 17:26.